Lionel E. Grimes, who is now deceased, was nicknamed ‘Bounce’ and ‘Big Red’ by those who knew him. 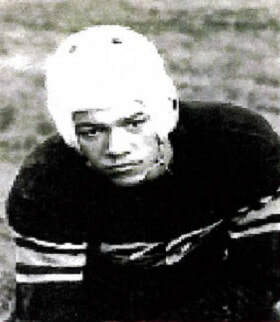 Grimes had an outstanding multi-sport career at Alliance High School, graduating in 1937. He was talented in every sport he attempted. He participated in football, basketball, baseball and track for the Aviators. He holds a rare distinction of lettering in four sports in the same school year. He was the ‘Iron Man’ of Alliance High School because of his talent and versatility. His coaches counted on him to be ready to play, and he delivered great performance after great performance for them and his team. ‘Bounce’ played left end on the Aviators’ football team. He made the varsity right away, an infrequent occurrence with the Aviators, as upper classmen usually dominated the roster. In his senior season, ‘Bounce’ Grimes was elected captain of the football team. 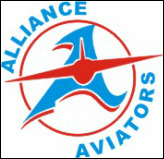 He led the Aviators, under head coach George M. Wilcoxon, to recording a 31-0 blanking of the Zanesville Blue Devils, one of their most lopsided wins of the season. In basketball, Grimes, who stood 5 feet 11 inches tall, lettered while alternating between guard and forward positions, again showing his versatility. He led the Aviators to many wins on the basketball court, including a 20 to 15 triumph over Cuyahoga Falls, where he was the Aviators leading scorer. In baseball, Grimes, with his outstanding speed, played the centerfield position. He recorded a tremendous .431 batting average for the Red and Blue. Grimes had an excellent athletic and academic career in college, but he left college three months before graduation to serve his country in the United States Armed Forces. He was assigned to Tuskegee for basic training, where he became one of the ‘Screaming Eagles’ who are known internationally for their service in World War II, and beyond.